The following is a post by Christopher Ebert, who uses his engineering background to mix and match options as a means of preserving portfolio wealth while outpacing inflation. He studies options daily, trade options almost exclusively, and enjoys sharing his experiences with anyone who is interested. I haven’t had much faith in my technical indicators lately. It seems like triple digit swings in the Dow have become the norm, not just daily, but often intraday. So rather than give myself an ulcer, over the next several weeks I will be tracking a set of boring option trades. I’m not making any predictions here, just taking my best shot and then reacting. This is not advice or a solicitation to trade any of the products mentioned; they are only examples to show possible ways to trade options and manage those trades. Each week, I will react to the market’s behavior by adjusting the trades accordingly. Volatility has been high for months now, but it is still fluctuating wildly. The first trade on my option’s list involves a short straddle on the iPath S&P 500 VIX Short Term Futures ETN (VXX). I’ll be attempting to capture the swings in volatility by opening new positions on VXX as it moves. I’d still like to get back into the market when things settle down. With the S&P still having support near the recent low at the 1110 level, I’ll be selling naked puts on the SPDR S&P 500 ETF (SPY). 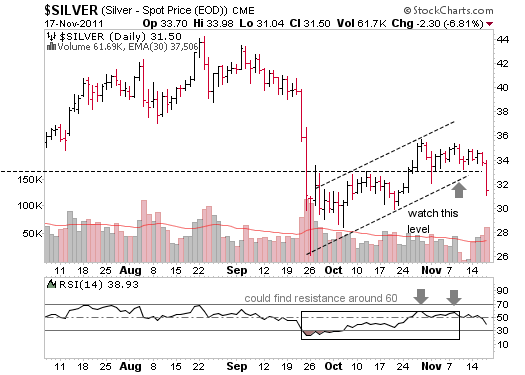 Anyone who follows Karen Starich here on Zentrader knows that there could be tough times ahead for silver and oil. 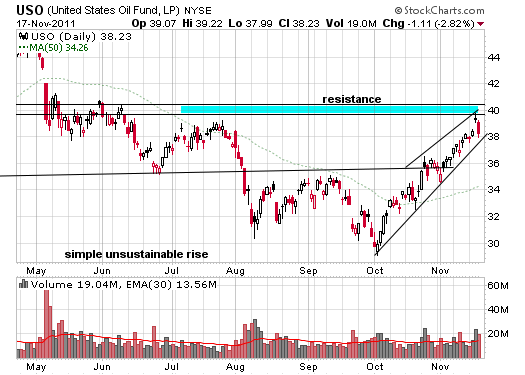 So I put together two trades to take advantage of a downturn in those sectors, one using options on Silver Wheaton Corp. (SLW) and one on the United States Oil Fund LP ETF (USO). Not wanting to risk too much, the first trade is a vertical bear put spread on SLW. Loss on the trade is limited to the net debit, and I hope to minimize that loss should it become necessary. Vertical spreads are also nice because they often close themselves out without resulting in a position in the underlying stock. Weakness in SLV will keep pressure on all miners. Hoping to capitalize on a drop in oil in the near term and a possible bounce back early next year, the last trade is a calendar call spread on USO. Again, it is a low risk trade due to the protection provided by the long call in case some unforeseen event causes oil prices to spike. If prices do drop in December, the short call would expire worthless and the premium retained could cover most or all of the loss on the long call, which could either be sold at that point, or held to benefit from a January rebound. I’ll be posting weekly updates on the progress of these trades, and any adjustments I have made, or think might be necessary in the near future.